So I joined my first swap. The Knitter's Tea Swap. 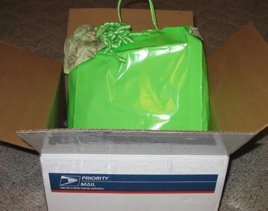 I had a lot of fun gathering up the items to send off to PA to my partner. And yesterday.... Ta Da! 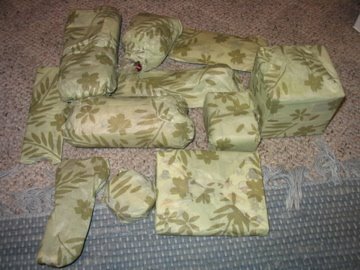 I got my package! 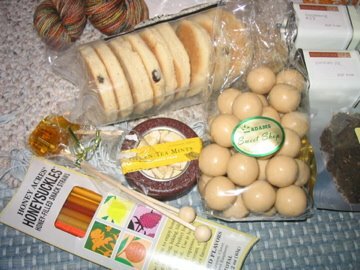 My swap partner is Babette at http://mother-of-purl.blogspot.com/ I can't wait to get over to her blog and get to know her. I opened everything very slowly and sampled along the way. 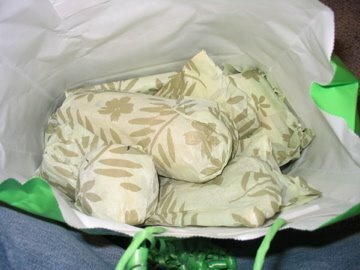 Just like Christmas I want to make each one last as long as possible. The whole shabang! With details to follow. 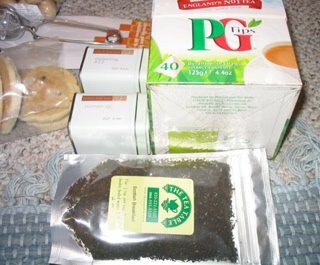 The Teas- Scottish Breakfast, PG Tips, and a couple more exotic blacks. The goodies! 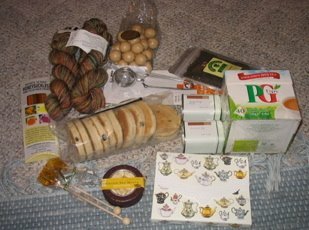 English Tea Cookies, (note the opened state of all the packages.) White Chocolate Malt Balls!!!! Those are amazing. Honey straws, a couple of honey candies. Green Tea Mints, and evading the picture. Teapot themed note cards that will just have to inspire a tea party this winter. They are perfect for the invitations And the grand finale, KOIGU!! My very first. I hadn't even seen any in person before, just on the web. 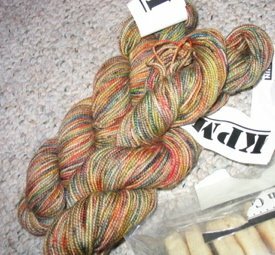 Lots of colors, and such a neat texture with the two plying.